An electric stove uses electricity to provide heat. An electric stove or electric range is a stove with an integrated electrical heating device to cook and bake. Electric stoves became popular as replacements for solid-fuel (wood or coal) stoves which required more labor to operate and maintain. Some modern stoves come in a unit with built-in extractor hoods. On September 20, 1859, George B. Simpson was awarded US patent #25532 for an 'electro-heater' surface heated by a platinum-wire coil powered by batteries. In his words, useful to "warm rooms, boil water, cook victuals...". Canadian inventor Thomas Ahearn filed patent number no. 39916 in 1892 for an "Electric Oven," a device he probably employed in preparing a meal for an Ottawa hotel that year. Ahearn and Warren Y. Soper were owners of Ottawa's Chaudiere Electric Light and Power Company. The electric stove was showcased at the Chicago World's Fair in 1893, where an electrified model kitchen was shown. Unlike the gas stove, the electrical stove was slow to catch on, partly due to the unfamiliar technology, and the need for cities and towns to be electrified. By the 1930s, the technology had matured and the electrical stove slowly began to replace the gas stove, especially in household kitchens. In 1897, William Hadaway was granted US patent # 574537 for an "Automatically Controlled Electric Oven". Early electric stoves were unsatisfactory due to the cost of electricity (compared with wood, coal, or city gas), limited power available from the electrical supply company, poor temperature regulation, and short life of heating elements. The invention of nichrome alloy for resistance wires improved the cost and durability of heating elements. In the United States, even though three companies had introduced electric stoves in 1908, penetration was rare; an electric stove was still considered a novelty in the 1920s. By the 1930s, decreased cost of electric power and modernized styling of electric stoves had greatly increased their acceptance. Electric stoves and other household appliances were marketed by electrical utilities to build demand for electric power. During the expansion of rural electrification, demonstrations of cooking on an electric stove were popular. In November 1905, David Curle Smith, the Municipal Electrical Engineer of Kalgoorlie, Western Australia, applied for a patent (Aust Patent No 4699/05) for a device that adopted (following the design of gas stoves) what later became the configuration for most electric stoves: an oven surmounted by a hotplate with a grill tray between them. Curle Smith's stove did not have a thermostat; heat was controlled by the number of the appliance’s nine elements that were switched on. After the patent was granted in 1906, manufacturing of Curle Smith's design commenced in October of that year. The entire production run was acquired by the electricity supply department of Kalgoorlie Municipality, which hired out the stoves to residents. About 50 appliances were produced before cost overruns became a factor in Council politics and the project was suspended. This seems to have been the first time household electric stoves were produced with the express purpose of bringing "cooking by electricity ... within the reach of anyone". There are no extant examples of this stove, many of which were salvaged for their copper content during WWI. To promote the stove, David Curle Smith's wife, H. Nora Curle Smith (née Helen Nora Murdoch, and a member of the Murdoch family prominent in Australian public life), wrote a cookbook containing operating instructions and 161 recipes. Thermo-Electrical Cooking Made Easy, published in March 1907, is therefore the world's first cookbook for electric stoves. The first technology used resistive heating coils which heated iron hotplates, on top of which the pots were placed. This was subsequently developed into a spiral hollow steel tube that had a heating element running through the middle. The tube was wound in a spiral underneath the pan. Unlike the earlier iron hotplate the steel spiral was heated to red heat imparting more heat to the pan than the hotplate could. In the 1970s, glass-ceramic cooktops started to appear. Glass-ceramic has very low thermal conductivity, a coefficient of thermal expansion of practically zero, but lets infrared radiation pass very well. Electrical heating coils or infrared halogen lamps are used as heating elements. Because of its physical characteristics, the cooktop heats more quickly, less afterheat remains, and only the plate heats up while the adjacent surface remains cool. Also, these cooktops have a smooth surface and are thus easier to clean, but are markedly more expensive. A third technology—developed first for professional kitchens, but today also entering the domestic market—is induction cooking. This process has hitherto only heated ferromagnetic cookware directly through electromagnetic induction. Recent developments have enabled non ferrous cookware to work as well, but not as efficiently as ferrous. Induction stoves also have a smooth glass-ceramic surface. Typical electricity consumption of one heating element depending on size is 1–3 kW. 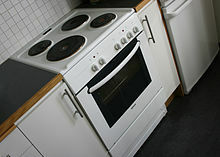 Wikimedia Commons has media related to Electric stove. ^ "Patent 39916 Summary". Canadian Intellectual Property Office. Retrieved December 26, 2018. ^ "Improved electric cooking stove". IP Australia. Retrieved December 26, 2018. ^ Introduction by H. A. Willis, "Thermo-Electrical Cooking Made Easy". Hesperian Press. Retrieved October 19, 2011. ^ "Electricity usage of a Stove Top - Energy Use Calculator". energyusecalculator.com. Retrieved 2018-02-19.